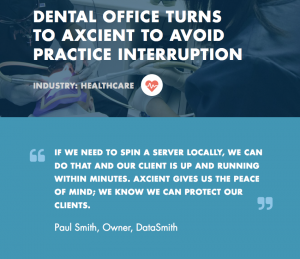 “Our main concern with Nashoba Family Dentists was one server that stored the majority of the office’s critical business information,” said Smith. “I knew we had to replace it with a new server because it could crash at any time. Before we began the switch, we deployed Axcient to backup their server should anything happen when we switched servers.” Smith’s concern was that if the server went down it would take the practice down with it; requiring hours to recover data – if the server was salvageable at all. “As soon as we proposed Axcient and deployed it, they encountered a disaster scenario,” said Smith. “The server crashed, but luckily we were able to spin up a virtual server within minutes – their business never skipped a beat.” “Sure enough when we began the switch, our old, outdated, server crashed and there was absolutely no way to get it back on or access files,” said Tina. “Luckily we had the Axcient backup so nothing was lost. What made Axcient even better is that we were able to almost instantaneously resume work because the Axcient backup operated in the cloud. 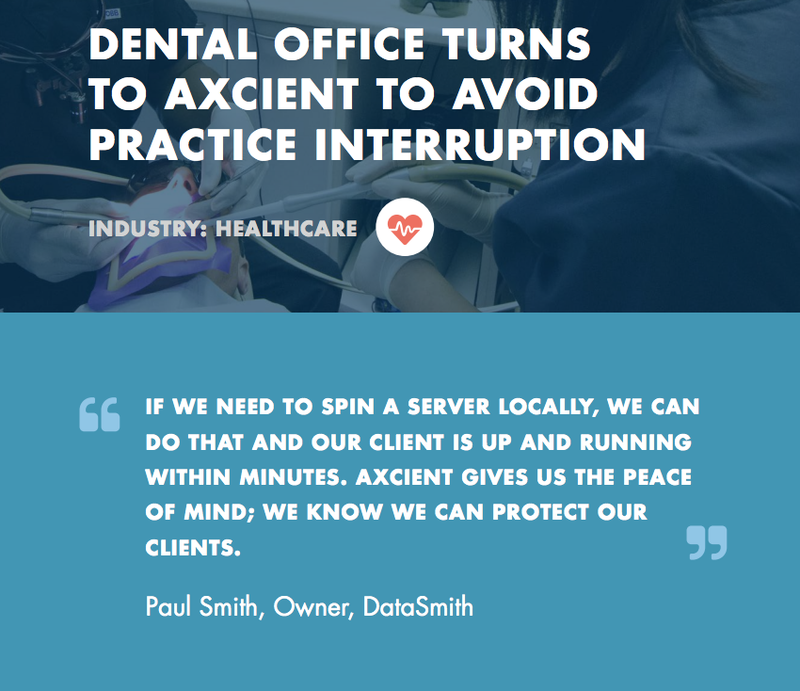 We had minimal down time and our clients never noticed the hiccup.” While the dental firm was running on Axcient, Smith and his team were able to perform a BMR (Bare Metal Restore) to a new server without interrupting the business. Nashoba Family Dentists didn’t miss a single appointment, meeting, or file. Datasmith was able to seamlessly keep their business running despite the disaster that ensued.